The use of window boxes is an inexpensive method to attract wildlife closer to your home, such as butterflies, bees and birds. 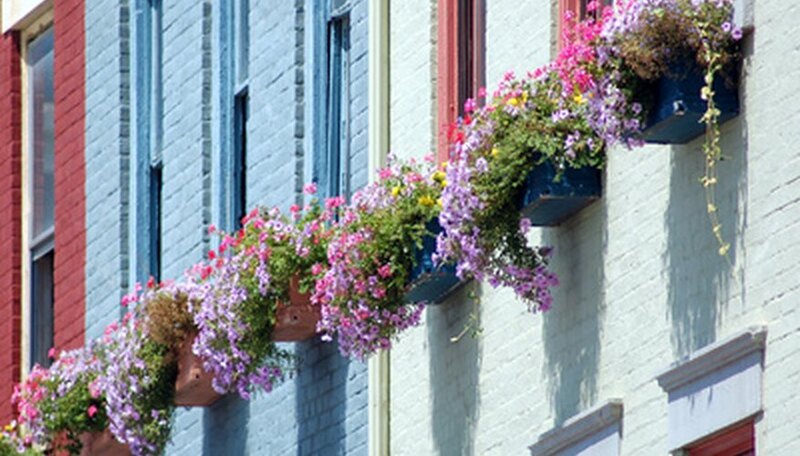 Window boxes add depth to your home’s exterior and provide additional color for landscaping. You can specialize in herb gardens, scented gardens or many other varieties with the use of window boxes. Choosing the appropriate size window boxes is important, to maintain a symmetrical look on your home’s exterior. Choose the window for mounting the window box. Use a tape measure to determine the length of the window from left to right. Start at the window’s trim on the left and measure to the end of the window’s trim on the right. If the window has shutters, measure from the start of the left shutter to the end of the right shutter. Write this length down. Repeat for each window that will hold a window box. The length of the window areas should equal the lengths of the window boxes. For example, if the length of first window is 3 feet, the window box should ideally be 3 feet. If the length of the second window is 6 feet, the window box should ideally be 6 feet. Use the tape measure to determine the height of the window frame by measuring from the top to the bottom. Write this measurement down. Use a calculator to determine one-quarter of the window's height. For example, the window measures 2 feet high. One-quarter of this is 6 inches. The height and depth of the window boxes should equal this number--6 inches--to maintain the best symmetrical form. Decide what types of plants you will use in the window boxes. Window boxes should be wider for larger container gardens and narrow for smaller ones. The window box width can vary depending on the type of container garden. For example, using a window box for a herb garden takes up less room than one with tall plants or plants plants with lots of roots. A vegetable window box with tomato would need to be wider and deeper to support the root system of the tomatoes. Have someone assist you in measuring the windows. Measure the windows from inside if they are too high to reach from ground level on the exterior of the home. Always let someone know if you are standing on a ladder to measure for window boxes.